While there is nothing like making spare ribs on the grill, there are times when you don't have room on the grill (usually when my husband wants to have ribs in addition to his bacon-wrapped cheeseburgers), it is too cold to grill or you just don't want to deal with the mess and clean-up of using the grill. 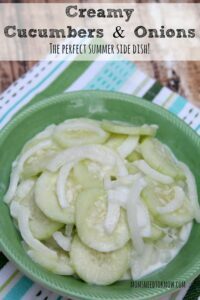 These creamy cucumbers & onions would be the perfect side dish for your crockpot spare ribs! I had heard that some people were able to make spare ribs in their slow cooker, but never tried it myself until recently – and we really liked the results! I should “back up” here a bit to explain something. Spare ribs, in our house at least, are kind of a big deal. My children have always been picky eaters and my daughter is the worst. But there is one thing that everyone in the family can agree on – and that is spare ribs (ok – and pizza). So we always want to ensure that, when we are trying something new, everyone is going to like it. Well, I am happy to say that these crockpot spare ribs were a “home run” in my family! They won't have the “smoky taste” of cooking them on the grill (although I guess you could add a few drops of liquid smoke to the crockpot or even the barbecue sauce (have you tried my homemade barbecue sauce yet?) to get that flavor. Another one of my favorite slow cooker recipes? 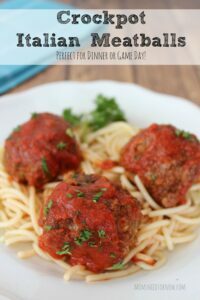 These crockpot Italian meatballs! The best part about cooking spareribs in the crockpot is that you get the same “low & slow” effect that you get when you cook them “low & slow” on the grill or in the oven. They become so tender that they are almost falling off the bone. But instead of having to “babysit” a grill or oven, you have the “set it & forget it” benefit of the slow cooker! If you are making the full 2 pounds of spare ribs (or a little more), you really want to make sure that you are not overlapping them because they won't cook evenly. I used my 6-qt crockpot for this recipe. If you don't have one that big, you may want to cut down on the amount of ribs that you use…but really – you should have a 6-qt slow cooker! It's not just for larger families. Sometimes, you just need some extra space with what you are cooking! So now you may be asking “what's with the applesauce”? Well – I thought that the addition of the apples and applesauce might give the sauce a little more sweetness and I still had some of my crockpot applesauce left over that I had previously canned and was trying to clear out my pantry before I start my next canning session. It was a “gamble” that turned out delicious! 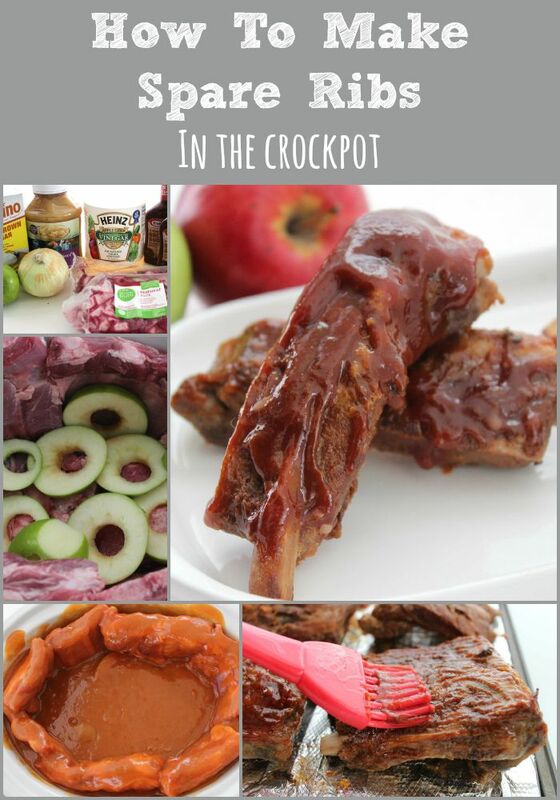 The apples and applesauce also help to add some more moisture while it is cooking….nobody wants dried-out ribs! You can make spare ribs in your slow cooker and have them turn out just as delicious as if you cooked them on the grill! Grab your slow cooker and give it a try! 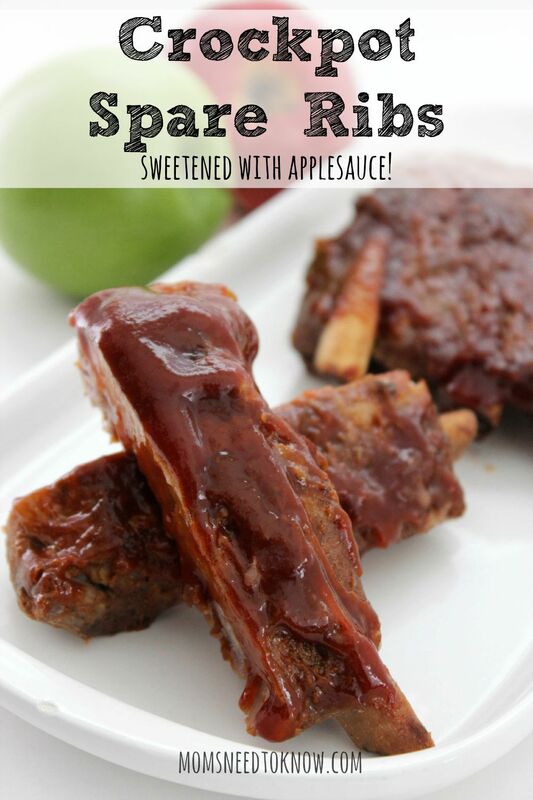 Spread apple slices over the ribs. Combine onion, applesauce, brown sugar, vinegar and ½ of the barbecue sauce in a blender or food processor. Pulse until smooth. Cook on high for 5 hours, or on low for 8 hours, until ribs are tender. Carefully remove the ribs from your slow cooker and brush with remaining BBQ sauce. Hi there – found your post on the freedom friday link party. I actually have never made ribs in the crockpot. I know, what?! I have a huge jar of homemade bbq sauce in my fridge so I definitely need to make this. Thanks for posting! This looks like a great, easy and yummy recipe! Thanks for linking up with us at the #HomeMattersParty and I hope you’ll join us again!